Aquarius Horoscope for 2012 highlights that divine help and blessings are seen for the Aquarian natives. Their spirituality level will increase and will then engage in philanthropic work for the welfare of society, children and ladies. Auspicious functions at home are also seen. Some may go for a short trip or may visit foreign countries. Name, fame, all around happiness etc is foreseen for the natives in 2012. Aquarius Horoscope for 2012 specifies that the native’s siblings will perform well and will help them in job or profession. Change of place or surroundings is on the cards. The natives should negotiate opposition or differences; tactful handling will ease out the atmosphere. Discomforts are foreseen for the natives during mid 2012. It is better to go for some mental and spiritual food to keep yourself mentally healthy and fit. The natives, who are aspiring for progeny, will witness a delay in begetting one. Please Note: The Aquarius Horoscope for 2012 given here are common for the natives of Aquarius and may differ according to an individual’s birth date and time. For a simplified, accurate & customized 2012 horoscope prediction, get your personalized 2012 yearly horoscope prediction report now. Aquarius Horoscope for 2012 highlights that there are no chances of facing any problems especially during the first half of 2012. Good health and vitality will help the natives to carry out their plans as desired. Some discomfort and obstructive ailments are foreseen during the later part of 2012. For long standing health problems, it will be a long and hard road; take care. Aquarius Horoscope for 2012 shows that financial situations will evolve favorably during this year. Imminent improvement on monetary front is on the cards. Long pending finances will return with ease. The acquisitions denied during the previous year will come to you without much effort. Purchase of property and vehicle will add pride in the family; however, double check all the documents in detail. The natives will be able to pay off their loans. 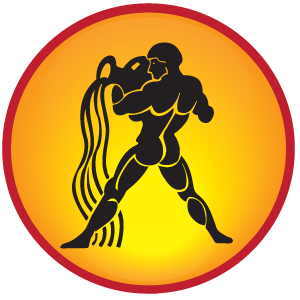 Aquarius Horoscope for 2012 indicates a promising year; however, mixed results in marriage and romance are also seen. Lack of warmth might be there in the relationship. It is good to be transparent on your relationship with your partner and you should not leave any space for misunderstanding. Aquarius Horoscope for 2012 indicates that the unattached natives will find their partner before May 2012. Some may feel bored and tired with their relationship. An innovative and novel approach will change the cold relationship into something striking. Let this year bring spiritual bliss.